The prince of pop and the beautiful Jessica Biel finally got hitched after five years of dating. The engagement ring was massive, so it was no surprise that the wedding would be an affair to remember too. What was most surprising was Jessica's choice of dress. Well, maybe not the style of dress, but bubblegum pink?! We're confused to say the least (WHO saw that coming?). If anyone could pull off the custom Giambattista Valli Haute Couture gown off, it's her. Jessica described wanting her dress to be "romance, romance, romance. Kind of whimsical and dramatic." We think she achieved it. 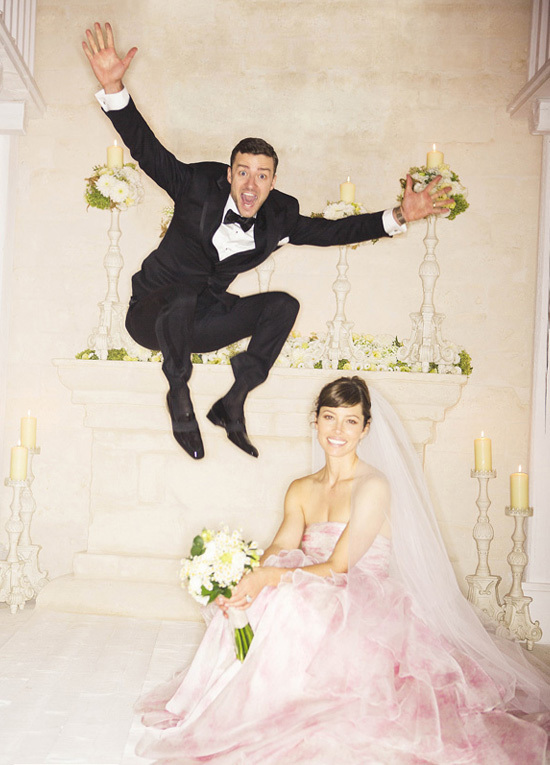 She carried a bouquet of chamomile, ranunculus and ruscus (gorg) and Justin looked smashing in a custom Tom Ford tuxedo. The couple got married in the Borgo Egnazia resort in the southern Italian city of Fasano with Justin serenading Jessica down the aisle to never before heard song that he wrote just for her. "I figured if there was something I was going to be able to offer, it would be to sing her down the aisle", said Justin. Ag sies, tog! We managed to snag a few pics off the Perez Hilton site - we love the dramatic, Grecian styled white bridesmaids dresses and the cake, maybe not quite our style, is pretty nevertheless! And just like that, another super star power couple gets married. What do you guys think of the pink dress?! We still can't decided whether we like it or not. What we do know is that we can't wait to see what their kids turn out to look like!